Nesscomp has been a Metastorm certified partner since 2001. We delivered numerous BPM projects on our own or in co-operation with Metastorm. Such an early involvement with Metastorm BPM platform makes us one of the most experienced BPM suppliers around. Our expertise comes from two directions: business improvement and applications development. This is a perfect fit with Metastorm BPM platform which requires both sets of skills equally. We deliver our services at very competitive rates. If your business processes have not been mapped and documented, and not prepared to being effectively automated, our business analysts will help you to achieve that. They will analyze your existing business practices and procedures and will document their current state (As-Is mapping). They will then identify any improvement opportunities, alignment of processes with business goals, potential for increasing efficiency, process integration, automation and management. The outcome, To-Be process maps, will be used to build a solution with the Metastorm BPM platform. We have experience of wide range of industries and processes. Developing a workflow application means taking a map of your business process and turning it into a computerised system. Based on prepared by us or by your analysts To-Be process maps, our system designers will design Metastorm BPM application architecture that is best suited for your business needs and performace. We will design business rules required for automation. We will create a set of roles reflecting your organizational structure and requirements to execute and manage the process. 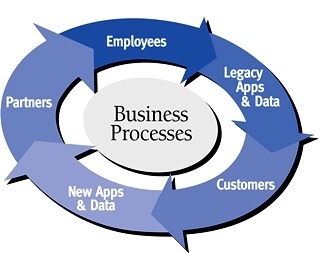 If necessary, we will integrate your process with existing databases and other business systems. Information architecture is one of the key aspects of a BPM application. We will design data structures and electronic forms for effective routing of process information. We will implement security rules strictly controlling access to data by specific groups of users. We will work very hard to maximise usability of your application. Our user interface (UI) designers are experienced in building intuitive workflow systems, including those public facing which were used without any training. Good administration and performance management of the process are critical. We will propose and deliver a suite of admin forms required for that purpose. Metastorm BPM application can work as a local business system, enterprise wide application or be exposed to general public. For each of these cases, an appropriate technical infrastructure has to be designed so that aspects like security, performace, scalability are properly taken care of. Our team of skilled engineeres can help you with this task. We can help your IT team to implement the infrastructure or undertake the complete task ourselves. Like any new system, Metastorm BPM application will change working practices of your employees. We can help you to plan deployment and migration from existing systems (computerised or manual). We can also help with training for the new application, so that your company has a smooth start to using it. If you have extended requirements for user interface (e.g. wide range of browsers compatibility), which can not be delivered by out-of-the-box BPM platform, we have experience with building custom interfaces utilizing a wide range of web technologies (Ajax, HTML5, etc.). One very useful toolkit, enabling construction of sophisticated user interfaces is a product called SWIFT, produced by BRD. SWIFT extends Metastorm BPM web client functionality and a;;ows building custom applications using ASP.NET programming. One example of SWIFT application would be if your processes were exposed to your different clients and you wanted to maintain separate branding of the system for each client (e.g. an agency serving multiple clients). Another example would be a company liaising with a large number of external suppliers (e.g. a publisher or a broadcaster) whose plethora of browsers and computer platforms might pose problems for a more rigid native BPM client. As SWIFT is fully integrated with the Metastorm platform, any changes to components exposed to the user (forms, stage names, actions, etc.) are only maintained in one place – in a Metastorm BPM map. This dramatically increases productivity and quality in case of business changes. Nesscomp uses SWIFT extensively in our projects and we can design and build custom user interface as required. It requires fine tunning in order to realize further benefits. Your business has changed and the system does not reflect live processes any more. User interface needs updating or become more compatible with newer browsers. The supplier who built the system can not provide you with their services. Our engineers and analysts are skilled in decomposing existing BPM systems so that effective enhancements can be applied quickly and effectively. Because of our experience in building systems for different industries and of high technical complexity, we are able to minimise the larning time. We can assess existing Metastorm BPM solutions developed by others. As part of this service we can look at technical infrastructure, Metastorm BPM application architecture, quality and standards of programming, application performance and other. As a result of our audit you will either gain a piece of mind that your system is working well, or we will point out which aspects are or could be causing problems in the future. If you do not have experienced IT support for your existing or new Metastorm BPM system, our engineers will be pleased to provide this function for you. We can support your infrastructure, application or both. We can support systems built with version 5 or later of Metastorm BPM (formerly known as e-Work).